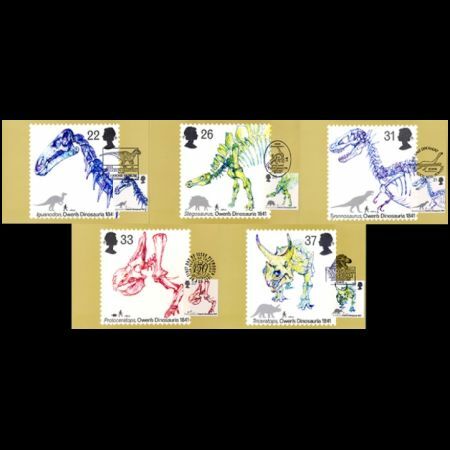 United Kingdom 1991 "150th Anniversary of Dinosaurs' Identification by Owen"
Outline of the animal and human for scale. Advancement of Science on Friday 30th July 1841. 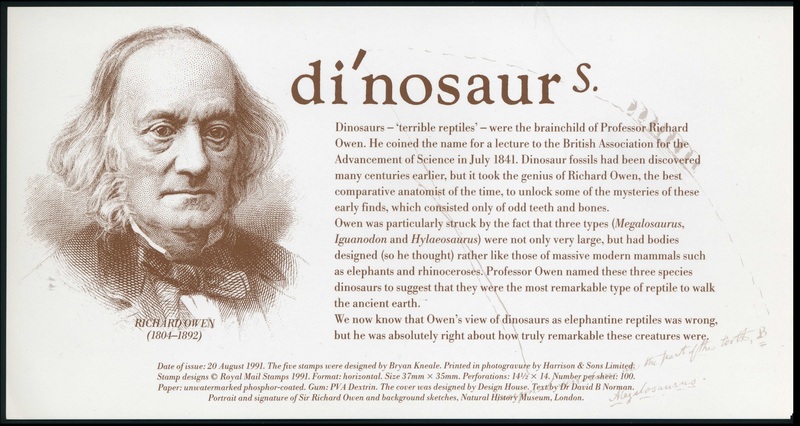 Dinosaur fossils had been disicovered many centuries earlier, but it took the genius of Richard Owen, the best comparative anatomist of the time, to unlock some of the mysteries of these early finds, which consisted only of odd teeth and bones. 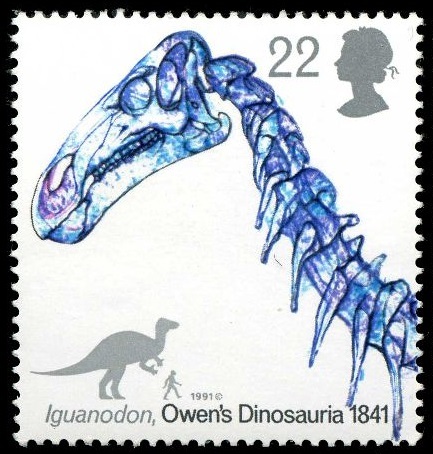 Owen was particularly struck by the fact that three types (Megalosaurus, Iguanodon and Hylaeosaurus) were not only very large, but had bodies designed (so he thought) rather like those of massive modern mammals such as elephants and rhinoceroses. Professor Owen named these three species dinosaurs to suggest that they were the most remarkable type of reptile to walk the ancient earth. 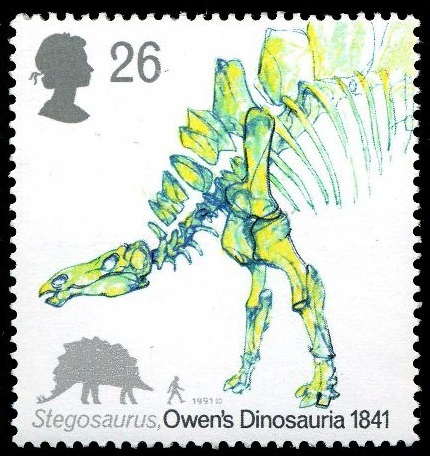 We now know that Owens view of dinosaurs as elephantine reptiles was wrong, but he was absolutely right about how truly remarkable these creatures were. 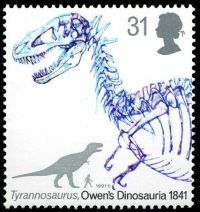 The idea of commemorate Owen's Dinosauria was suggested by British paleontologist & professor of Geology & Zoology and popularizer of science - Lambert Beverly Halstead (13 June 1933 - 30 April 1991). 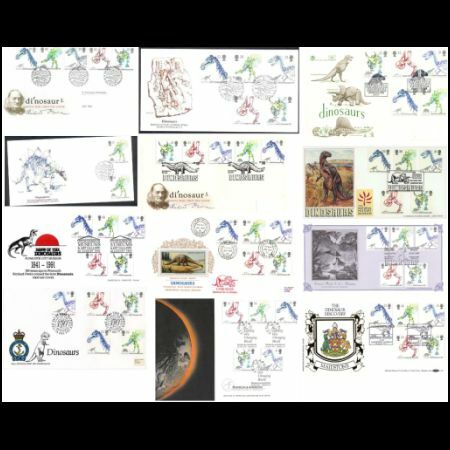 His idea got a wide support from many leading scientist of Geology and Paleontology. 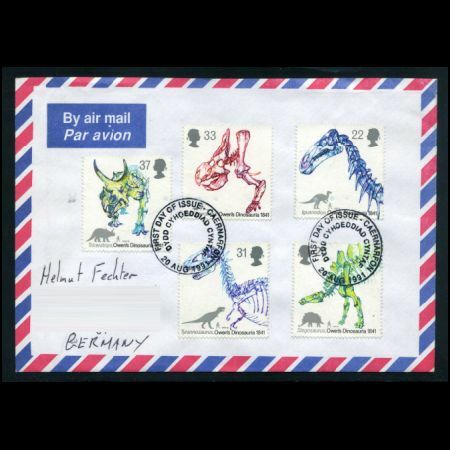 After the theme was accepted by Royal Mail, four designers (Mrs. Jenny Halstead, John Larkin, Christopher Wormall and Bryan Kneale) asked to produce some stamps draft. 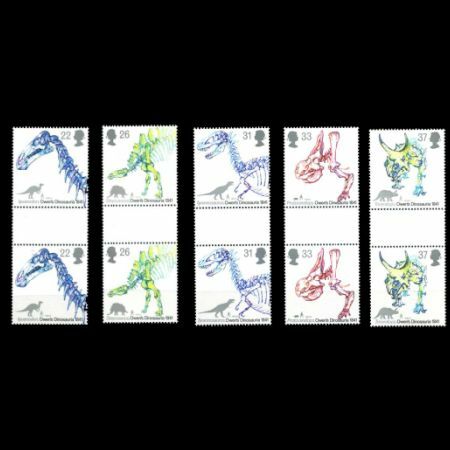 The draft of Mr. Bryan Kneale is selected by Design Department of Royal Mail and Stamps Advisory Commitee. 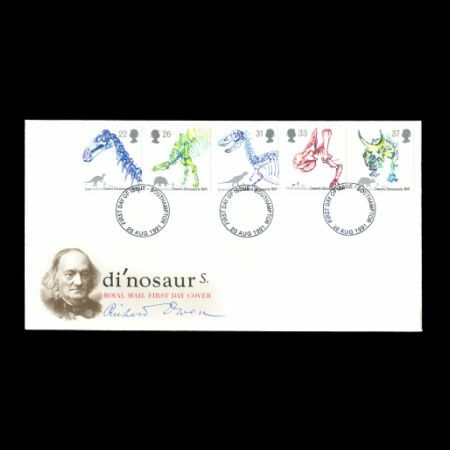 Richard Owen (l8041892) was a medical anatomist who trained at Edinburgh and St Bartholomews Hospital, London. In the nineteenth century the medical profession was evolving and expanding, long before the days of the dreaded Chicago medical malpractice lawyer and exorbitant malpractice insurance rates. He was appointed Hunterian Professor at the Museum of Royal College of Surgeons and went on to build for himself a formidable reputation as Britains leading comparative anatomist. 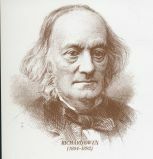 His career continued to prosper and, after the completion of the Natural History Museum in 1881, Sir Richard Owen (as he was later to become) was appointed as the first Superintendent of Collections. 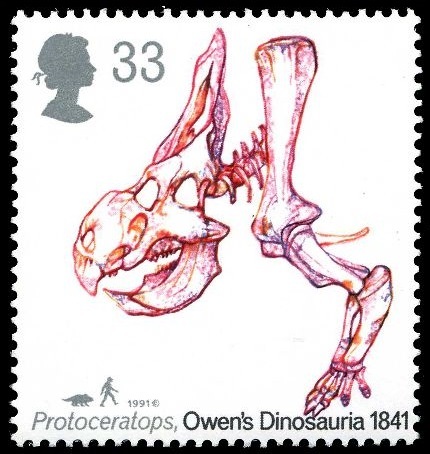 Owens broad and expert knowledge of both living and fossil animals made him a natural choice to review British fossil reptiles during the late 1830s. 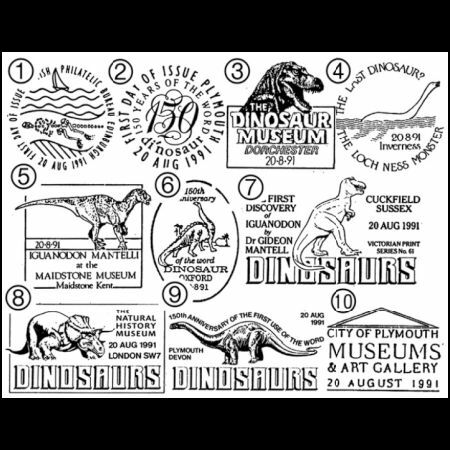 The need for such a review had become pressing because in the early years of the nineteenth century an explosion in the rate of discovery and description of fossils had occurred. 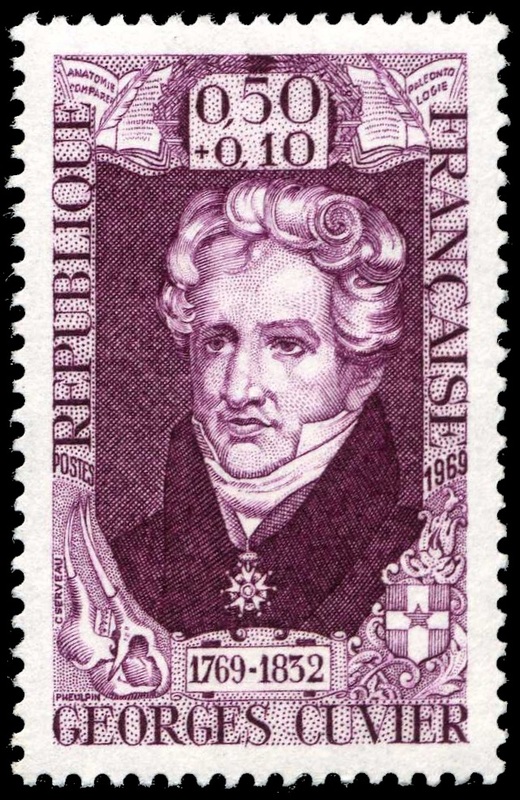 Great excitement and interest had arisen in collecting and studying fossils of all types through the work of the Frenchman Baron Georges Cuvier (1769-l832). ln the 1790s and early 1800s Cuvierhad been able to prove, for the first time, not only that fossils were the remains of once living creatures rather than simply being curious stones which could be dug from the ground, but also that some fossil reptiles must have been monstrously large. Understanding the true nature of these early finds was difficult because the fossil remains were almost always isolated teeth and fragments of bone. 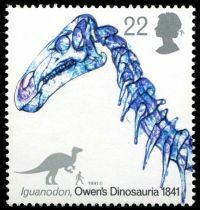 Here Owens skill as an anatomist proved to be most important, for heg was able to deduce from a vast array of material in private collections scattered throughout the country that some of the fossil reptiles discovered in Britain during the 1820s and 1830s were not only very large, but quite unlike those living today. He concentrated on three types of giant reptile: Megalosaurus (big reptile), Iguanodon (iguana tooth) and Hylaeosaurus (forest reptile). Each of these animals was very large (in Owens estimation about 9 metres long) and had massive, pillar-like legs, short powerful toes and a backbone built for great strength. All these features seemed to Owen to belong to. lanndliving creatures bearing a strong resemblance to the maassive tropical mammals of today, such as rhinoceroses and elephants. 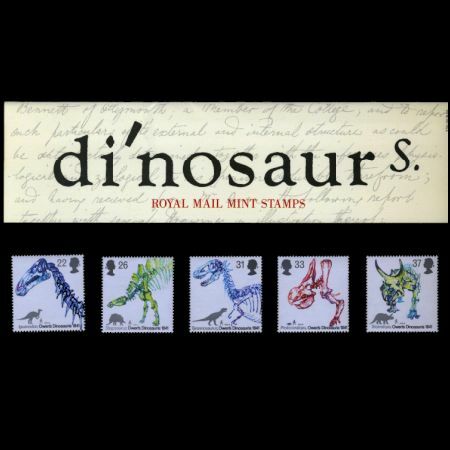 He therefore classified them as a distinct tribe or suborder erof Saurian Reptiles for which l would propose the name of Dinosauria. He considered them to be important, believing that they represented the ultimate stage in reptilian design, mimicking as nearly as was possible the form of the largest living tropical mammals, at a time in the past when the world was ruled by reptiles. The combination of Owens fame and the concept of the dinosaur captured the public imagination and received a further boost in the early 1850s. In 1852 Joseph Paxtons Crystal Palace, which had formed the centrepiece of the Great Exhibition of 1851 in Hyde Park, was dismantled and moved to a new permanent site at Sydenham. During the planning for the reopening, it was suggested that the grounds around the Palace should be landscaped and a populated with life-sized models of prehistoric animals. 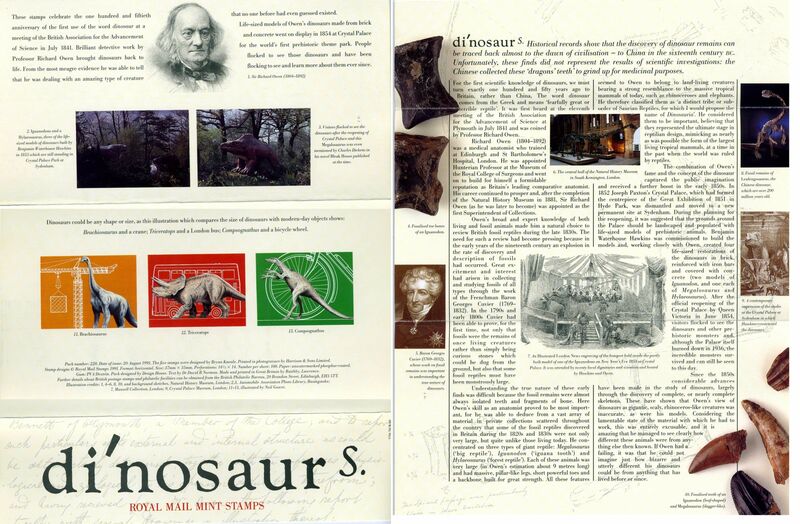 Benjamin Waterhouse Hawkins was commissioned to build the models and, working closely with Owen created four life-sized restorations of the dinosaurs in brick, reinforced with iron bars and covered with concrete (two models of Iguanodon, and one each of Megalosaurus and Hylaeosaurus). After the official reopening of the Crystal Palace by Queen Victoria in June l854, dinosaurs and other prehistoric monsters and, although the Palace itself burned downin 1936, the incredible monsters survived and can still he seen to this day. 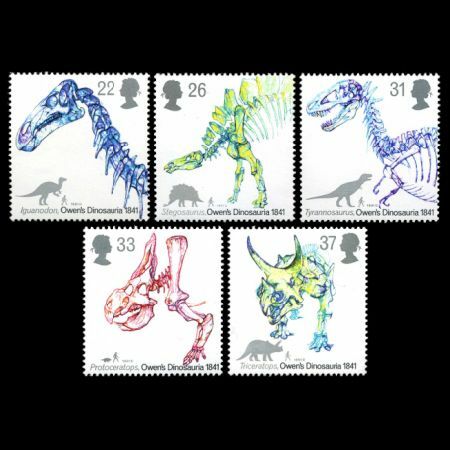 Since the 1850s considerable advances have been made in the study of dinosaurs, largely through the discovery of complete, or nearly complete skeletons. 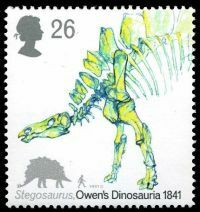 These have shown that Owens view of dinosaurs as gigantic, scaly, rhinoceros-like creatures was inaccurate, as were his models. Considering the lamentable state of the material with which he had to work, this was centiirely excusable, and it is amazing that he managed to see clearly how different these animals were from anything else then known. 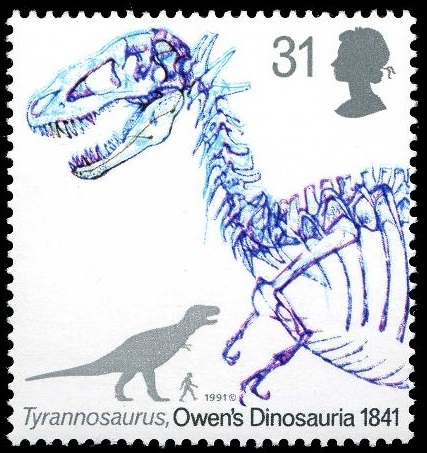 If Owen had a failing, it was that he could not imagine just how bizarre and utterly different his dinosaurs could be from anything that has lived before or since. Named in 1825 by English geologist Gideon Mantell, based on sime teeths found by his wife, Mrs. Mary Ann Mantell, in 1822 in Sussex, southern England. 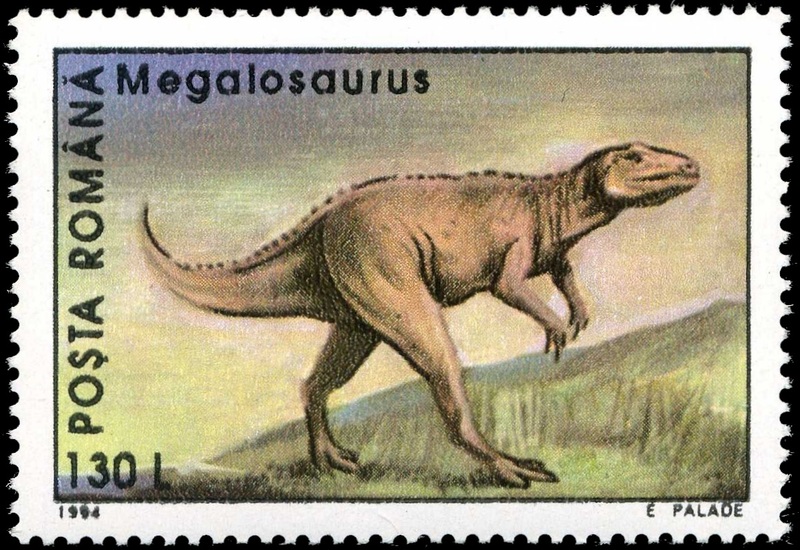 Iguanodon was the second dinosaur formally named, after Megalosaurus. Together with Megalosaurus and Hylaeosaurus, it was one of the three genera originally used to define Dinosauria. It had a large thumb spike which could have been used to collect vegetation or to defend itself. A better specimen was discovered in a quarry in Maidstone, Kent, in 1834 (lower Lower Greensand Formation), which Mantell soon acquired. He was able to identify it as an Iguanodon from its distinctive teeth.The Maidstone slab allowed the first skeletal reconstructions and artistic renderings of Iguanodon. As such, he made some mistakes, the most famous of which was the placement of what he thought was a horn on the nose.The discovery of much better specimens in later years revealed that the horn was actually a modified thumb. 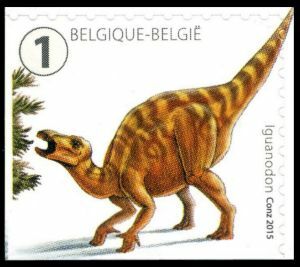 The largest find of Iguanodon remains to date occurred on 28 February 1878 in a coal mine at Bernissart in Belgium, at a depth of 322m when two mineworkers, accidentally hit on a skeleton that they initially took for petrified wood. With the encouragement of Alphonse Briart, supervisor of mines at nearby Morlanwelz, Louis de Pauw on 15 May 1878 started to excavate the skeletons and in 1882 Louis Dollo reconstructed them. 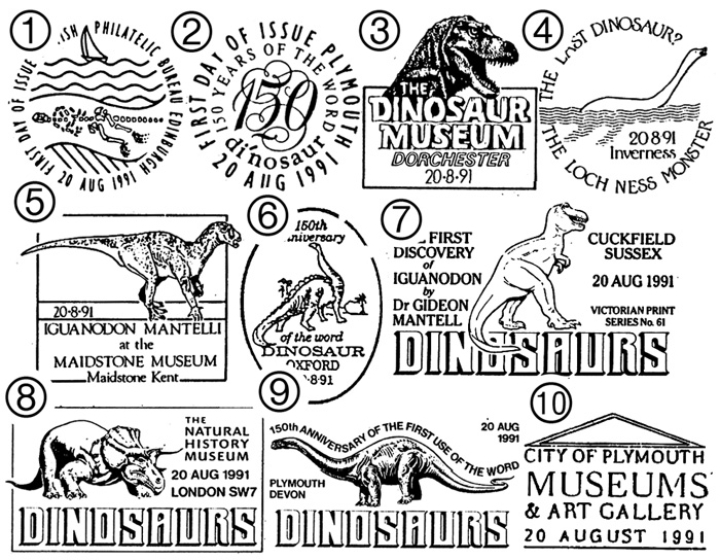 At least 38 Iguanodon individuals were uncovered, most of which were adults. Many of them went on public display beginning in July 1883 and are still present for viewing. The exhibit makes an impressive display in the Royal Belgian Institute of Natural Sciences, in Brussels. 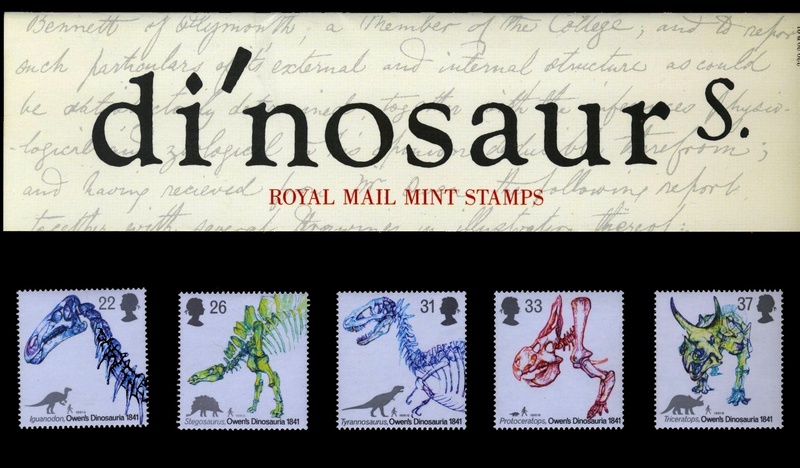 A replica of one of these is on display at the Oxford University Museum of Natural History and at the Sedgwick Museum in Cambridge. Most of the remains were referred to a new species, Iguanodon. bernissartensis, a larger and much more robust animal than the English remains had yet revealed, but one specimen was referred to the nebulous, gracile Iguanodon. mantelli (now Dollodon bampingi). The skeletons were some of the first complete dinosaur skeletons known. 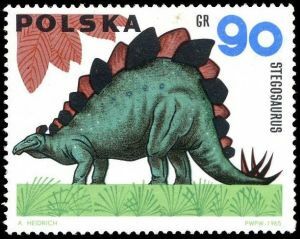 Stegosaurus , meaning "roof lizard" in reference to its bony plates is a genus of armored stegosaurid dinosaur. They lived during the Late Jurassic period some 155 to 150 million years ago in what is now western North America. 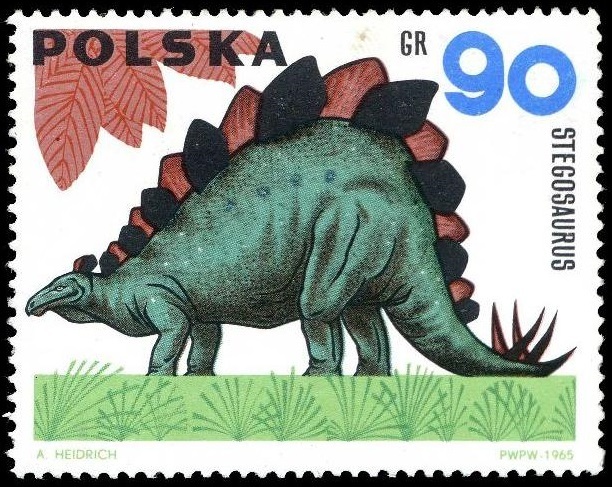 In 2006, a specimen of Stegosaurus was announced from Portugal, showing that they were present in Europe as well. Due to its distinctive tail spikes and plates, Stegosaurus is one of the most recognizable dinosaurs. A large, heavily built, herbivorous quadruped, Stegosaurus had a distinctive and unusual posture, with a heavily rounded back, short forelimbs, head held low to the ground and a stiffened tail held high in the air. Its array of plates and spikes has been the subject of much speculation. The spikes were most likely used for defense, while the plates have also been proposed as a defensive mechanism, as well as having display and thermo regulatory functions. Stegosaurus had a relatively low brain-to-body mass ratio. It had a short neck and small head, meaning it most likely ate low-lying bushes and shrubs. 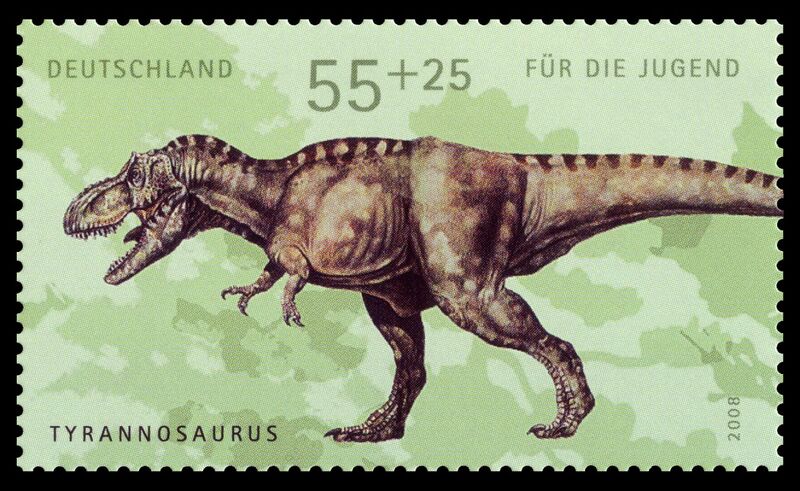 Tyrannosaurus is a genus of coelurosaurian theropod dinosaur. It lived throughout what is now western North America, with a much wider range than other tyrannosaurids. Fossils are found in a variety of rock formations dating to the Maastrichtian age of the upper Cretaceous Period, 67 to 65.5 million years ago. Like other tyrannosaurids, Tyrannosaurus was a bipedal carnivore with a massive skull balanced by a long, heavy tail. Relative to the large and powerful hindlimbs, Tyrannosaurus forelimbs were small, though unusually powerful for their size, and bore two clawed digits. Although other theropods rivaled or exceeded Tyrannosaurus rex in size, it was the largest known tyrannosaurid and one of the largest known land predators, measuring up to 12.8 m in length, up to 4 metres tall at the hips, and up to 6.8 metric tons in weight. By far the largest carnivore in its environment, Tyrannosaurus rex may have been an apex predator, preying upon hadrosaurs and ceratopsians, although some experts have suggested it was primarily a scavenger. The debate over Tyrannosaurus as apex predator or scavenger is among the longest running in paleontology. 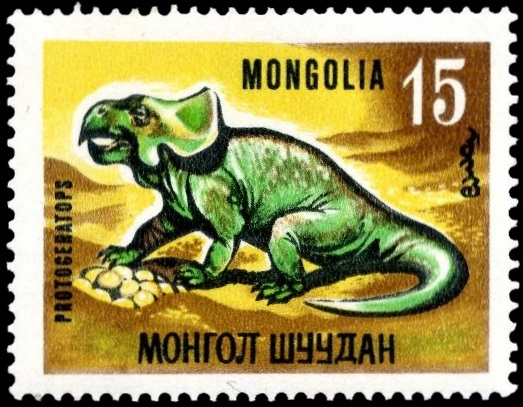 Protoceratops is a genus of sheep-sized (1.5 to 2 m long) herbivorous ceratopsian dinosaur, from the Upper Cretaceous Period of what is now Mongolia. It was a member of the Protoceratopsidae, a group of early horned dinosaurs. 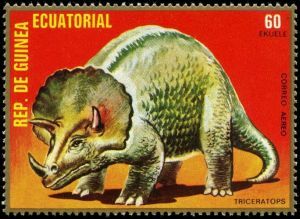 Unlike later ceratopsians, however, it was a much smaller creature that lacked well-developed horns and retained some primitive traits not seen in later genera. Protoceratops had a large neck frill, which may have served to protect the neck, to anchor jaw muscles, to impress other members of the species, or combinations of these functions. Described by Walter W. Granger and W.K. Gregory in 1923, In the 1920s, Roy Chapman Andrews discovered fossilized eggs in Mongolia that were interpreted as belonging to this dinosaur, but which turned out to be those of Oviraptor. Triceratops is a genus of herbivorous ceratopsid dinosaur which lived during the late Maastrichtian stage of the Late Cretaceous Period, around 68 to 65 million years ago in what is now North America. It was one of the last dinosaur genera to appear before the great CretaceousPaleogene extinction event. The term Triceratops, which literally means "three-horned face". Bearing a large bony frill and three horns on its large four-legged body, and conjuring similarities with the modern rhinoceros, Triceratops is one of the most recognizable of all dinosaurs and the best known ceratopsid. It shared the landscape with and was preyed upon by the fearsome Tyrannosaurus, though it is less certain that the two did battle in the manner often depicted in traditional museum displays and popular images. The function of the frills and three distinctive facial horns has long inspired debate. Traditionally these have been viewed as defensive weapons against predators. 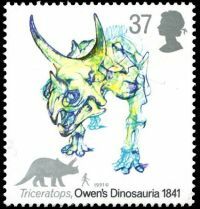 More recent theories, noting the presence of blood vessels in the skull bones of ceratopsids, find it more probable that these features were primarily used in identification, courtship and dominance displays, much like the antlers and horns of modern reindeer, mountain goats, or rhinoceros beetles.The theory finds additional support if Torosaurus represents the mature form of Triceratops, as this would mean the frill also developed holes (fenestrae) as individuals reached maturity, rendering the structure more useful for display than defense. The cover for official FDC was designed by Design House. Textby Dr David B Norman, Portrait and signature of Sir Richard Owen and background sketches, Natural History Museum, London.